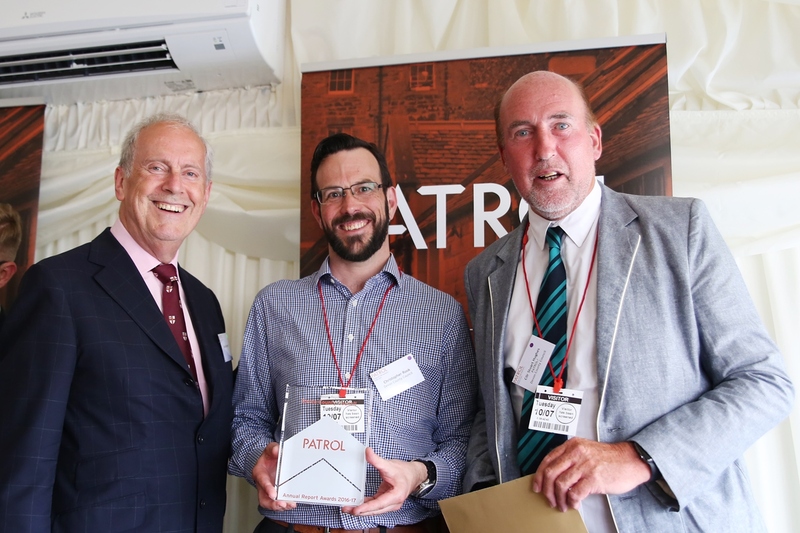 The annual PATROL PARC (Parking Annual Report Awards by Councils) Awards took place on Tuesday 10 July at the Houses of Parliament. Devon County Council received the award for Best Overall Report during an event that shone a light on the fantastic work being done by our local authority members across England and Wales to inform and engage on civil enforcement in their localities. Councillor Stuart Hughes, Devon County Council Cabinet Member for Highway Management, and Christopher Rook, Traffic Management Team Manager, received the award on behalf of the council. An introduction to the PARC Awards ceremony was provided by Huw Merriman, MP for Bexhill and Battle, who shared some valuable insight and encouragement to local authority attendees on the importance of their mission to improve the communication of parking and other civil enforcement activities within their municipalities. This was followed by a spirited talk from broadcaster and author Gyles Brandreth, whose father, Charles, was chief legal advisor to the AA from the 1930s through to the 1970s and penned the landmark book, Parking Law, which became the world authority on the subject. The PARC Awards recognise the local authorities that have articulated and communicated on parking enforcement in their area in a compelling, well-structured way, through the production of an annual report. As part of PATROL’s work to support its local authority members and raise awareness of the objectives of civil enforcement, the PARC Awards have also been designed to reward, share and promote best practice in local authority annual reporting, nationwide. The Best Overall Report award is judged on the overall presentation, how helpful it is to the local community, the policies, scheme design and the quality of the information provided. Councillor Stuart Hughes, Devon County Council Cabinet Member for Highway Management, said: “Devon County Council is delighted to be recognised as overall winner. The annual reporting format provides an excellent opportunity to promote our service, allowing the public to understand how we operate, and seeing what is being achieved in managing our network. Cumbria County Council: Highly commended for best practice reporting in Customer Service. Derby City Council: Highly commended for best practice reporting in Innovation and New Services. Brighton & Hove City Council: Highly commended for best practice reporting in the Presentation of Finance and Statistics. Other local authorities shortlisted by the review group were: Borough of Broxbourne, Durham City Council, Sunderland City Council and Worcester City Council. Moving forward for future years, PATROL will also be giving an award for Outstanding Digital Format, in order to recognise those local authorities that harness digital to improve the accessibility and availability of parking information. Civil parking enforcement involves managing limited parking resources on behalf of the community. Having an informative and well-designed parking annual report can simplify the process for local authorities to demonstrate their benefit and value to the community, and help to change public attitudes towards enforcement. You can view highlights of the event here.